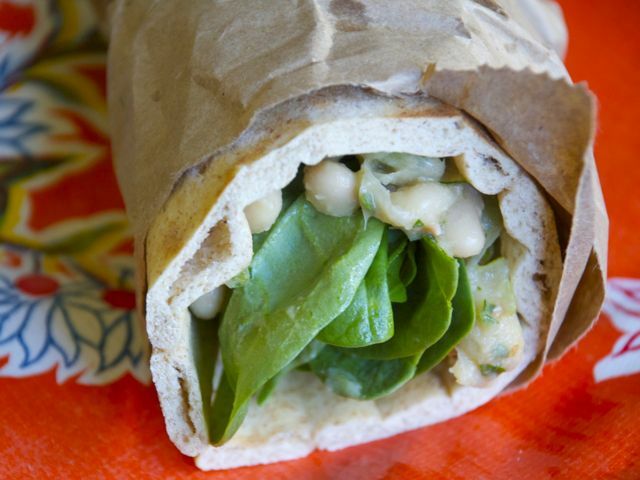 These wraps turn a pantry staple — canned white beans — into something unexpected. In Turkey, this wrap is made with purslane, a succulent wild green, but dandelion or any small, tender, bitter green is fine. Toss the beans, parsley, scallions, Near East pepper, and salt to taste in a medium bowl. Drizzle with 1 tablespoon of the lemon juice and 2 tablespoons of the oil and toss again. Adjust the seasonings, adding salt and Near East pepper to taste. Toss the greens with the remaining 1 tablespoon lemon juice and remaining 1 tablespoon oil in a medium bowl. Sprinkle with salt to taste and toss again. Lay the warmed wraps flat on a work surface. Place some greens on the bottom half of each wrap. Spoon some beans over the greens and roll up the wraps, tucking the sides toward the center to form neat bundles. Slice each roll in half and serve. Near East pepper, also called Aleppo pepper, looks like hot red pepper flakes, but the flavor is sweet, smoky, and only a little bit spicy. If you don't have access to a Middle Eastern market, you can approximate its unique flavor by combining 3/4 teaspoon sweet paprika and 1/4 teaspoon hot red pepper flakes.